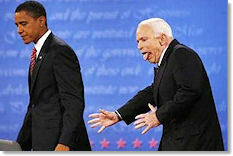 Analysts think McCain's erratic behavior (above) is hurting him. Report: Cuba Has as Much Oil Offshore as U.S. Challenges Russia to do same. Confirms suspicions of critics, academics, casual observers, men, women, children. Most were reassigned to look into ACORN. It's always darkest before it's every man for himself. Some can't stand her, barely tolerate him; others can't stand him, barely tolerate her. By locking himself in his office.